← Only 119 Days Until Christmas. Yesterday, I picked up a comic that was the final episode to a three part ‘crossover’ story. 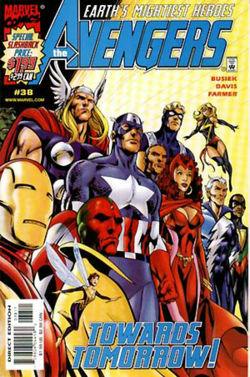 In comic-speak, a crossover is when a storyline runs through two or more titles. In this instance, It went from X-Factor to She-Hulk and then back to X-Factor. It hasn’t been a ‘must-read’, but a perfectly decent trifle. The first two chapters were entertaining and the artwork was serviceable. But this final installment…blargh. The story was fine if a bit predictable. But, the artwork was some of the worst I’ve ever seen. Faces that looked like they were smudged and arms that looked like legs and vice versa. Hideous. I had to flip to the last page and just read the final panel to wrap the story up and protect my delicate sensibilities from the terror of it all. 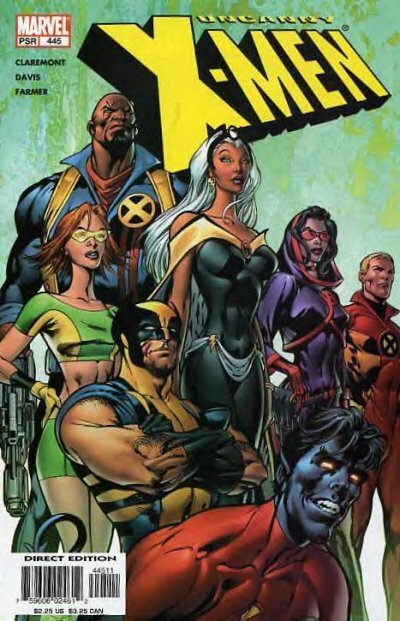 It brings up an endless debate for comic nerds: Who is more important in comic story-telling? The writer or the artist? I tend to favor the writer in this argument. Pretty pictures are great but if you’re picking up a comic to do more than just stare at the panels (i.e. read it), then you need a good tale. Otherwise, well…I wouldn’t stick around for issue number two. On the other hand, I’ll tolerate art that I’m not crazy about if the story is masterfully told. Usually. Today’s great thing is an example, however, of the power of a good penciller. Look what I can do when Alan Davis draws me! Excalibur was kind of like a cross between The Avengers and X-Men, but based in the UK and a bit more whimsical. As you can see, the team was comprised of (from left to right) A Thundercat, Simon Cowell, Celine Dion, Nightcrawler, a mullet enthusiast, Sarah Jessica Parker, a big eared robot, a hallucination, an aerobics instructor, and Captain Britain. Or something like that. The point is, they all look good! Even that mullet isn’t looking too bad. 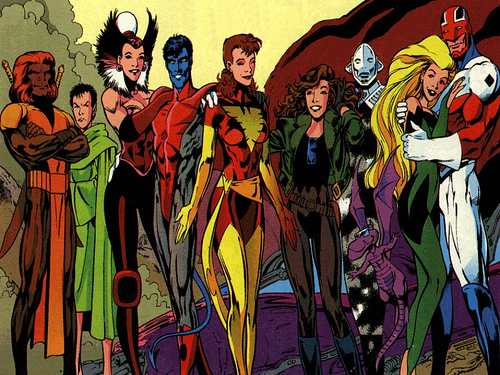 Alan Davis draws beautiful people. 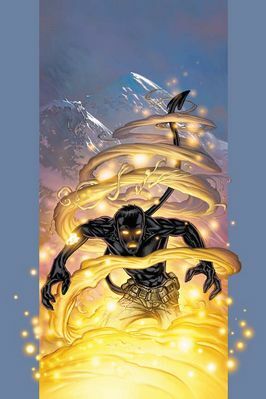 Look at Nightcrawler bobbing and weaving. What a page. Llooking good…even with a plaster cast on his leg! 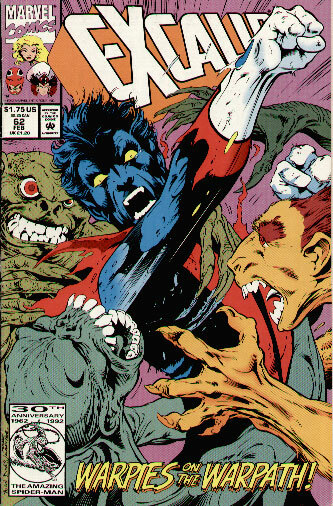 Pencillers, I think, take loads of license with Nightcrawler. He’s a mutant who is CLEARLY a mutant. He’s not someone who can blend in like Cyclops or even pointy-haired Wolverine. He’s otherworldy with his velvety-textured blue skin (not tattooed like in the movie) and pointy ears. 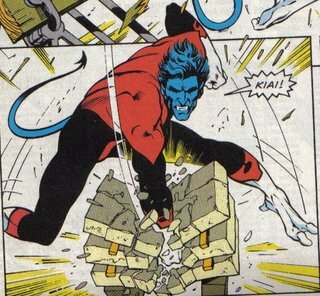 Because of that, I guess, artists like to go bananas and express themselves in that artsy fartsy way…all at the expense of poor old Nightcrawler. Take a look at these other versions. They’re not all bad, but it’s a good spread of how many different interpretations that you can get of the fuzzy blue one. I feel like, sometimes they don’t know what the hell to do with his feet. Other times, they give him a mutant ‘fro’. Hi forehead and hair just seem to be married…. Actually, the sketch that is above is by the guy who actually created the character, Dave Cockrum. Still, I think Alan Davis does it better. He’s evolved the character perfectly. 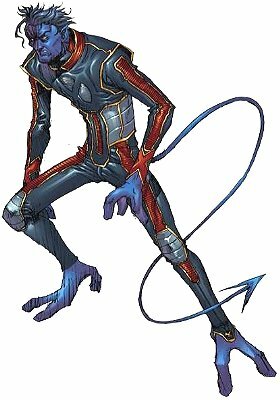 This portrait of Nightcrawler, to me, really represents what’s best about the character. Look at that handsome devil! 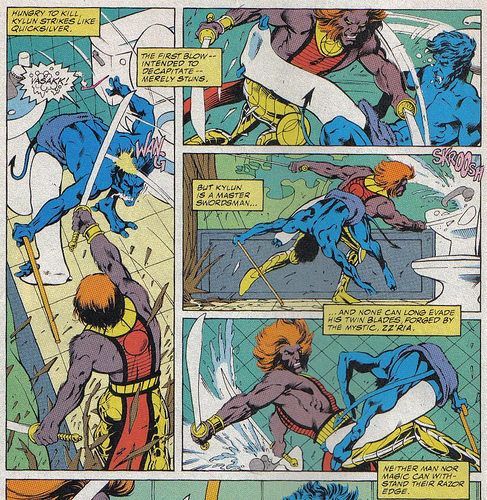 Jumping around, having a good time, smiling, laughing, teleporting, maybe sticking to walls from time to time, gripping a fencing foil in his prehensile tail, cracking wise, hanging out with best bud Wolverine, chatting up the ladies…those were the days. 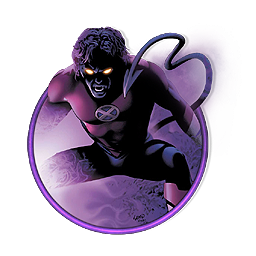 Nowadays, thanks in part to a monstrous storyline by one of my least favorite writers, Chuck Austen, we have a brooding and melancholic Nightcrawler who is forever obsessing over his Catholicism. For some, I suppose, the lure of playing the cliched ‘looks like a devil but is really an angel’ angle was far too strong. They even made him a priest for a short time. Blargh! Talk about testing my faith. The X-books, in safer hands now, seem to be sloooooowly taking Kurt back to his more carefree roots. I mean, he’s got super cool fangs, bright yellow eyes, is supernaturally agile and has mega-martial arts skills and a bitchin’ foreign accent. Why so gloomy, ladykiller? OK, I realize I’m harping on about this. I’m done. For now. Maybe he’s just sad that Alan Davis hasn’t drawn him in awhile. If I were a comic book character, I’d want Alan Davis to draw me. It’s nothing but smooth lines and tossled hair, baby. He’s a Brit, actually, is Alan Davis. When joined by countryman, Mark Farmer on inks, it’s a best case scenario for all involved. Here’s some more Alan Davis art. He makes everyone pretty. 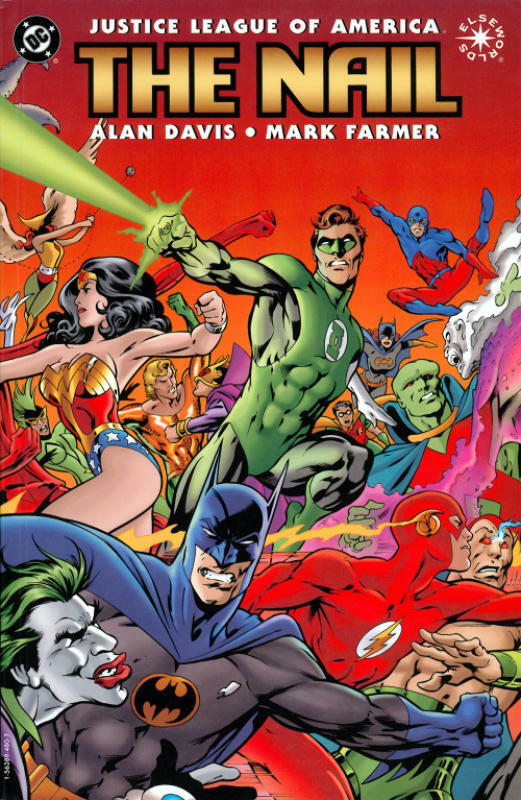 By the way, all these pics are copyright of Alan Davis, DC, Marvel, whatever…just have to say it, I think. 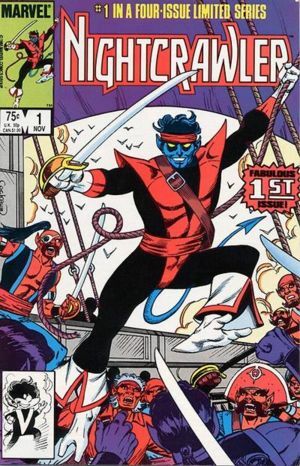 I can’t believe they killed Nightcrawler off. He’s one of my favourite characters. I also hated it when he became so moody and turning into a priest? He loves his faith but to give up girls? Hmmm, I thought he was much more carefree and into life. Nice post by the way, you expressed everything perfectly. (except Kitty looks nothing like Sarah Jessica Parker).